Mysterious Island could just as easily be named "Jules Verne Land," as his works are the primary inspiration for this area of Tokyo DisneySea. It is the smallest area of the Park but it holds two of the biggest attractions: Journey to the Center of the Earth and 20,000 Leagues Under the Sea. Contradictory to its name, Mysterious Island is not an island at all. 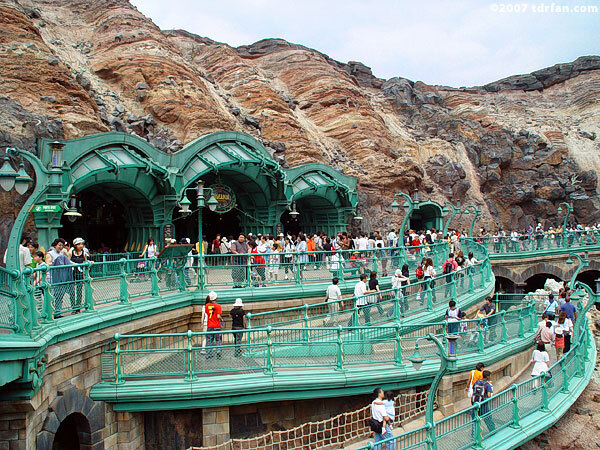 It is instead built into the side of Mount Prometheus, the giant volcano that is the Park's centerpiece and most prominent feature. Because Mount Prometheus is an active volcano (thanks to the help of Disney magic), there is a restless energy all around you. Steam can be seen escaping from cracks in the side of the volcano. The landscape is rocky and devoid of plant life. There is a turbulent waterway which occupies the center of the area, and geysers shoot up dozens of feet in the air. Although Mysterious Island seems big, besides the two aforementioned attractions there's not a lot to do here. There is one restaurant, one small shop, and that's about it. Unless you have a complete aversion to thrill rides though, you will want to at least come here to ride Journey to the Center of the Earth.